After weeks of judicial inactivity, the International Criminal Court last Thursday issued four significant rulings, by three theoretically independent organs. The Prosecution formally closed its case — exactly two years after the case opened, and four years after the confirmation hearing. The Trial Chamber granted the Defence teams the opportunity to appeal seven issues emanating from its controversial decision to admit the recanted statements of five witnesses. And, as a distracting side show, the Pre-Trial Chamber unsealed two new warrants of arrest for Kenyans accused of witness interference, Paul Gicheru and Philip Kipkoech Bett, and reaffirmed an existing warrant of arrest for Walter Barasa. It is not coincidental that these rulings were delivered simultaneously. The Court is obviously alive to the political landscape in Kenya and abroad, and it uses the timing of its decisions to invoke political leverage and to elicit positive media attention for the Prosecution. This is not the first time that we have seen such a confluence of decisions being handed down by the Court. In 2012, the Court insisted in issuing the confirmation decisions in the PNU case and the ODM case at the same time. In 2013, it unsealed the arrest warrant against Barasa, on the basis of interference, just as the Assembly of States Parties was convening to discuss to the amendment to Rule 68, which revolved around interference. More recently, the Trial Chamber in the Ruto case waited to issue its decision on the Rule 68 statements until the same day that the Appeals Chamber in the Kenyatta case issued its decision on the Government of Kenya’s cooperation. The coordination between the Chambers appears tactical. 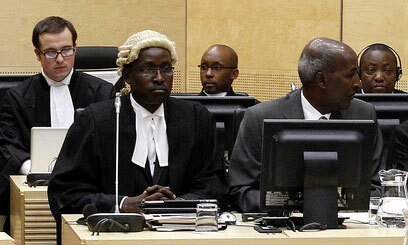 Yet this is but one arrow in the ICC’s quiver. The other tactic is to constantly shift the goal posts, when the game does not go its way. The ‘International Criminal Court’ may be more aptly named the ‘Institute of Continual Change’. The case against William Ruto and Joshua Sang has changed dramatically since the case started. Gone are the stories of meetings where commanders are named and guns distributed. Gone are the stories of planning and an organized network of perpetrators. What remains is but a skeleton of the original concept. The Court has fought to find a way to keep the case afloat despite the weak evidence. Witnesses were summoned to testify against their will for the first time in the ICC’s history, and to the surprise of the signatories to the Rome Statute. Recanted statements were admitted into evidence, even when the witnesses told the judges under oath that those accounts were lies. Modes of liability were expanded and charges were re-characterised, all in an attempt to increase the options available to the Prosecution. Similarly, when the collapse of the case against President Kenyatta was imminent, and the rancour about non-cooperation was at its highest, the Court ordered a special status conference and ordered the President to attend, even though his attendance this was not a legal requirement. This demonstrated the Court’s insatiable propensity for the pursuit of individuals and the creation of scapegoats, rather than the administration of justice. The Court hoped that the President would not attend, thereby violating his conditions of summons, such that a warrant of arrest could be issued for him. Despite all of these shenanigans, it is difficult to hold the ICC to account. The Court remains impervious to criticism and operates within an institutional impunity. The Rome Statute, per Article 112(4), provided an option for the ASP to set up an independent oversight mechanism, for inspection, evaluation and investigation of the Court, in order to enhance its efficiency and economy. Inexplicably, this has never been done and the ICC itself operates above the law. However, the closure of the Prosecution case and the chance to appeal remain significant opportunities for the defence. These developments should not be lost amongst the noise and drama of alleged witness interference. It is clear the organs of the Court are in close cahoots. But the prayers of a righteous people are powerful and effective. What has a beginning, must have an end, and I believe it is near.